This lesson and the balance sheet example below will show the format and components of this key report. The balance sheet, together with the income statement and the statement of changes in equity, forms part of the financial statements of a business. And just like these previous two statements (income statement and statement of changes in equity), the balance sheet is usually drawn up annually. But there is one key difference between the balance sheet and those other two reports, a difference which is very important and which you really need to understand. Whereas the income statement and statement of changes in equity show changes over a certain period of time (changes to income and expenses and changes to the owner's equity), the balance sheet shows the balances of assets, liabilities and owner's equity on a particular day. 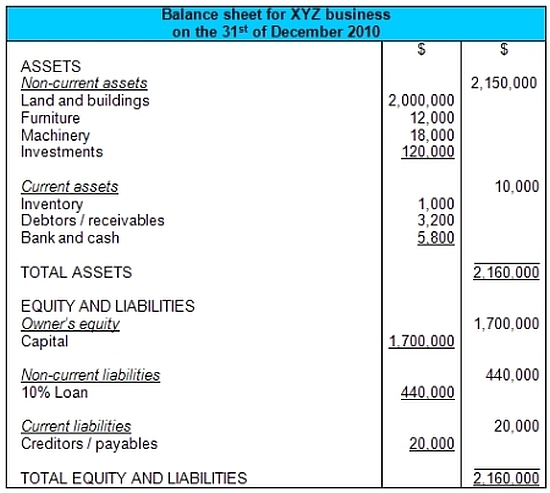 The balance sheet thus provides a snapshot of a business at an exact point in time - it shows the balances of the various accounts on the last day of the reporting period. As you can see from the balance sheet above, the total of the assets agrees in value (balances) with the total of the owner's equity and liabilities. One can clearly see that the balance sheet shows the accounting equation of a business, except that this accounting equation is turned on its head and shown in a vertical format, with the assets on top and the equity and liabilities on the bottom. Now, remember in our earlier lesson on the accounting equation and financial position, how we said that the comparison of the assets, liabilities and owner's equity actually shows us the financial position of a business? Well, the balance sheet is actually known by another name. Want to guess what that is? The balance sheet is also known as the statement of financial position. But bottom line, just remember that the balance sheet is simply the accounting equation in the vertical format. 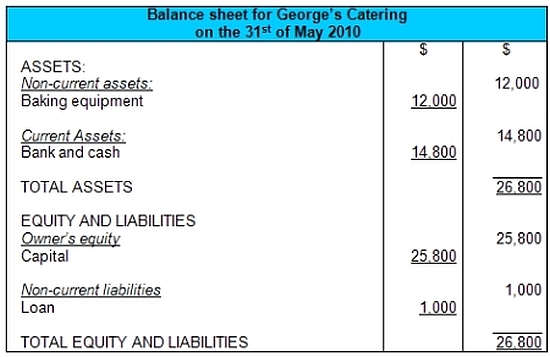 The balance sheet used to sometimes be shown in a horizontal format, instead of the vertical format shown above. This horizontal format basically looked like one giant T-account for the whole business, with Assets on one side and Liabilities and Owner's Equity on the other. Also, the balance sheet is often abbreviated as BS or B/S. The balance sheet also divides the assets and liabilities into categories. 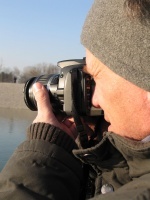 Assets and liabilities must be divided up into long-term and short-term categories. The dividing line between current and non-current is one year from the date that the balance sheet is issued. In other words, an asset will be classified as current if it is expected to be sold (or used) in less than a year from the date of the report. An asset will be classified as non-current if it is expected to be used for more than one year from the date of the balance sheet. A liability that is expected to be paid off within a year, such as a creditor, is classified as current. A loan, which is expected to be paid off more than a year from the balance sheet date, is classified as a non-current liability. The division of assets and liabilities into these subcategories is done to provide more meaningful information to the readers of the balance sheet. One type of asset that we haven't gone over in previous lessons is investments. Investments are also known as other financial assets. This category of assets includes investments in other businesses as well as long-term investments with the bank. Note that investments are usually non-current assets (unless you intend to sell off the investment within a year, in which case it is classified as a current asset). As mentioned previously, inventory are stock or goods. See our later section on inventory for numerous lessons on this topic. The "10% loan" in our balance sheet example above means that we have a loan that has a 10% interest charge on it per year. Here is our previous trial balance for George’s Catering, the example we have been using throughout our lessons. Our balance sheet is going to require the balances of all assets and liabilities. So we stick these in there from our trial balance. That's fairly simple. But what about the owner’s equity - how do we figure this out for our balance sheet? It's not shown anywhere in the trial balance! The answer is that we take the closing balance of the owner’s equity from the statement of changes in equity and put this in our balance sheet. First we draw up the income statement and get the profit. Then we put this profit into the statement of owner's equity and get the closing balance of the owner's equity. Finally, we take this closing balance of owner's equity and put it into our balance sheet. As a final point, just like the income statement, the balance sheet can also be drawn up at the start of the period with budgeted figures, and these budgeted figures (assets, liabilities, equity) can later be compared to actual results on a specific day. Hope this lesson and our balance sheet example helped! If you feel good about this lesson on the balance sheet, then go right ahead and check out the next lesson on the Cash Flow Statement.